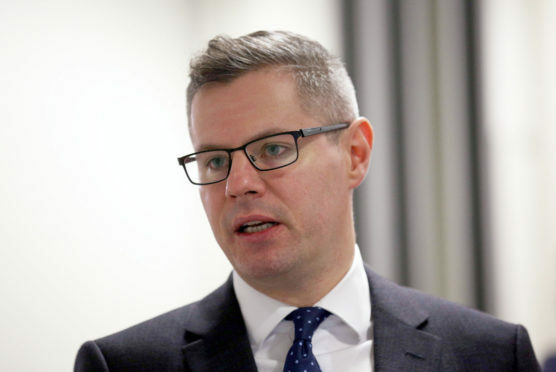 The total council tax bill for the north and north east is poised to increase by more than £15million in 2019/20, Finance Secretary Derek Mackay indicated last night. The council tax rise was included in figures released by the Finance Secretary revealing how much each local authority can expect in funding from the Scottish Government following last week’s Scottish budget. Mr Mackay said council funding across Scotland amounted to almost £11.2billion but the package included the assumption that local authorities would use their own powers to increase council tax by 3%. According to Mr Mackay’s figures, raising council tax by that amount would generate almost £80m across Scotland, of which £15.378m would be collected in the north and north east area. Last night Mr Mackay was accused of “short-changing” councils and forcing households to pick up the bill. To meet the Finance Secretary’s £11.2 forecast, total council tax gathered in Aberdeen City would increase by £3.669m in the coming year, giving a total funding package of more than £376m. The total bill in Highland Council would go up by £3.770m, contributing to an overall package of more than £504m. Aberdeenshire would see an increase of £4.197m and Argyll and Bute £1.559m. Moray would see its total rise by £1.287m while the Western Isles would see a total increase of £0.327m. The total council tax collected in Orkney and Shetland would go up by £0.280m and £0.289m. A 3% increase on council tax paid on a Band D property in Aberdeen would amount to an extra £38 on a householder’s bill. Alexander Burnett, Scottish Conservative MSP for Aberdeenshire West, said: “The SNP is simply short-changing local authorities and forcing council tax payers to pick up the slack. While Scottish Lib Dem leader Willie Rennie claimed local government was “getting the short end of the stick”. Last night Mr Mackay claimed his funding package delivered a real terms increase in overall funding of £210m since 2018/19. But experts at the independent Scottish Parliament Information Centre (SPICE) have said core budgets are being cut by £319m. Mr Mackay said: “The Scottish Government has continued to ensure that our partners in local government receive a fair funding settlement despite further cuts to the Scottish Budget from the UK Government. “After removing the health uplift the Scottish Government fiscal resource block grant funding goes down by £340m or 1.3% in real terms for 2019-20. Despite that reduction, we have still provided a 2% real terms uplift in the total Local Government settlement for 2019-20. Matthew Reiss, vice-chairman of the Highland Council’s Corporate Resources Committee, said: “Experience tells us that careful analysis of the budget figures is always required to properly ascertain how much of the core government grant has been ring-fenced for specific Scottish Government projects, such as the expansion of early learning. “Inflation has been rising up to approximately 3% and there have been significant increases in the cost of some core items such as fuel and rock salt for gritting. “The decision to raise council tax is one for the local authority and perhaps indicates the Scottish Government’s response is identifying that local authorities will have no choice but to raise council tax. “The position that COSLA has adopted is that local authorities are in the most challenging situation ever experienced in recent times and we await news of pay objections, for example with teachers, and are also hoping that the relatively mild start to winter continues.